I doubt that many people who met Falkus easily forgot him. Hugh was inspirational, charismatic, irascible, frustrating, obnoxious and amusing - often all at once. He was a gifted writer and presenter, a fine fisherman and a man who took such awful care of his life and business affairs that at times it seemed he was taunting fate. So many stories circulate about him that it is becoming difficult to sort apocrypha from truth, particularly since in Hugh’s case, it was frequently difficult to believe what was actually happening, even if one had witnessed it first hand. I cannot think of anyone who knew Hugh who does not hold a strong opinion about him, one way or the other, but the one character trait upon which everyone is united is that he was a great communicator. The Stolen Years and his short story about a sea trout have deservedly been judged classics and it has always been a mystery to me why Falk didn’t write more than he did – apart from the fact the daunting amount of work involved. 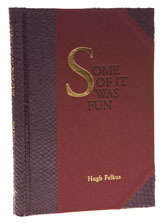 Maybe Hugh was happy with his books on sea trout and salmon fishing and his superb collaboration on freshwater fish with Fred Buller, but all the same, it was difficult not to feel that Falkus had more to say. The illustration shows Medlar's limited edition, which was bound in salmon skin. I am sure that Hugh would have raised a glass to that. Probably several.